Our principal Sunday service is at 10:30am – High Mass - with the beautiful music, traditional liturgy, thoughtful preaching and poetic prayers for which the Church of England is known throughout the world. God. 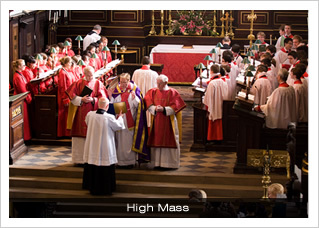 Our clergy, their assistants, and the choir wear traditional vestments (robes), and incense is often used. The service follows the "Order One in Traditional Language" liturgy from the Book of Common Prayer, with two readings from scripture (as appointed in the 1662 Book of Common Prayer) followed by a sermon. There is time for prayer and quiet, times to stand and sing, and a shared Eucharist (Communion) each week. The tenor of the service will vary with the seasons and the schedule of scriptural lessons. The mood is friendly and warm, quiet and contemplative, and also exuberant and uplifting, sometimes all in one service. If you are familiar with the Church of England, you will find something of the timeless and traditional in this service - our Eastward facing celebration focuses us all on God, rather than looking in on our own community. If you are unfamiliar with Anglican worship, you will find the service a subtle mix of Roman Catholic and Protestant practice. Many find it to be a very satisfying balance, ancient ceremony and prayer reaching back to the earliest Christians, aimed at a very personal understanding and relationship with a very much "living" God. If you are visiting us you are welcome to participate in the service as much as you feel comfortable. As you will see, there is some variety in the way different individuals at All Saints worship; some make the sign of the cross, others don't, some prefer to kneel when praying, others prefer to sit. You will not be conspicuous or embarrassed, and if you have questions or are unsure what to do, please ask a neighbour.